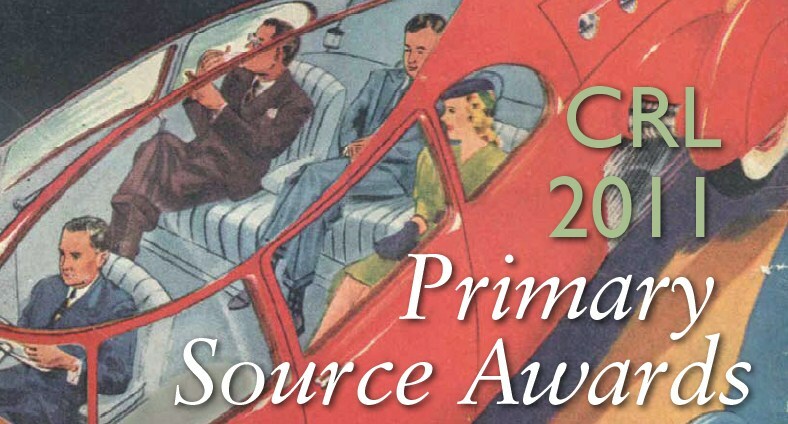 This detail from a cover of Popular Science magazine from CRL collections was used on the Primary Source Awards flyer. The Center for Research Libraries first developed the Primary Source Awards in 2009 to recognize innovative uses of primary source materials by faculty, librarians and library staff, graduate students, and other researchers in the CRL community in three arenas: access, research, and teaching. This year CRL received nominations from universities and colleges in ten states, with such intriguing projects as a “Senior Thesis Camp” (Notre Dame), a Shakespeare Online Archive (Penn State), and a “Rare Book Academy” that gave children an understanding of early print culture (Ohio State). Nominations for the 2012 awards will be accepted beginning June 1, 2011. Faculty and staff at CRL libraries are encouraged to consider other staff, faculty, or colleagues as candidates for these awards; self nominations are also accepted. Awardees receive a gift certificate from Powell’s Books; an iPod Touch is given to the persons who nominate the award finalists. Please see the Eligibility and Selection sections on the CRL website for information on participants and the selection process.